From April 23 to September 14, 2015 Venice Peggy Guggenheim Collection is inviting for an unique retrospective of Charles Pollock, a little bit forgotten brother of famous Jackson. When someone says “Jackson Pollock” everybody at least vaguely knows what is going on — American artist, abstract movement, action painting, drip technique… But try to ask about Charles Pollock — most of people will shrug their shoulders. When his younger brother became in some way a recognizable pop-star, Charles stood in the shadow. Charles (b. Denver, 1902; d. Paris, 1988) was the oldest of the five sons of LeRoy and Stella Pollock. In his twenties, he moved to New York, where after four years came his younger brother, Jackson. Charles’s social commitment made his biography prototypical of artists’ experiences in the decade of the 1930s. Fireworks (1950) and Chapala series (1956) were his first substantial abstract works. In 1960. he traveled to Europe and spent most of his time in Rome, when he was studying the works of Italian old masters and meeting contemporary American and Italian artists like James Brooks, Piero Dorazio or the Pomodoro brothers. His travel resulted in a group of color abstractions, called the Rome series. After coming back to USA, thanks to regular exhibitions and widen circle of colleagues, Charles joined to avant-garde movement from which he had broken a generation earlier. Charles Pollock: A Retrospective gives visitors an amazing opportunity to see the majority of Pollock’s works — paintings, sketches, drawings as well as many photographs and documents, some of them presented to the wide audience for the very first time, thanks to the artist’s widow and daughter, Sylvia Winter Pollock and Francesca Pollock. 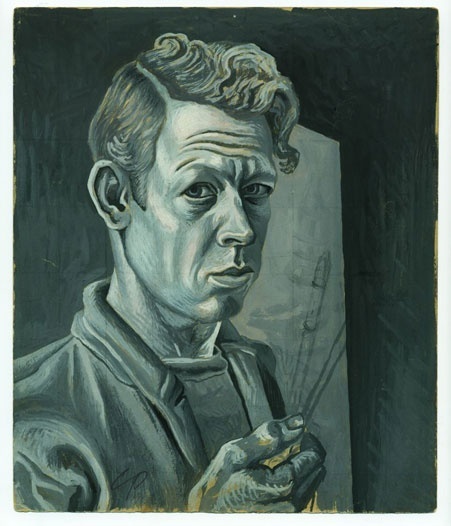 According to Philip Ryland, who curated the exhibition, this is the first time that his entire career has been presented to the public, including the decade of his Regionalism, or American Scene painting.Incidentally, we catch a glimpse of Pollock family life before World War II — Leroy and Stella Pollock and their five sons, the artistic aspirations of Jackson and his brother Sanford to become artists following the example of Charles and the close relations of all three to their teacher and mentor, Thomas Hart Benton. The first part of the exhibition sheds light therefore on American art and society in the Depression era. In the 1940s however, Charles abandoned his illustrative, realistic, Regionalist content and turned to abstraction. The second narrative of the exhibition is therefore a case study, presented here for the first time, of a classic trope of Modernism: the artist who developed pictorial abstraction out of early realistic content. The Peggy Guggenheim Collection decided to organized Charles retrospective, because of... strong association with Jackson Pollock. As the Mr. Ryland says, Jackson career was launched by Peggy Guggenheim in the 1940s and the gallery’s collection included 11 paintings by him. This constitutes a valid context for ‘discovering’ the art of his little known eldest brother Charles, a painter not only closely tied to the early ‘Regionalist’ years of brother Jack, but the maker of highly accomplished abstract paintings that can be associated with what Clement Greenberg defined in the 1960s as ‘post-painterly abstraction’ and ‘color-field painting’. The revelation of little known episodes in the history of art is among those services — to scholars and to the general public — that museums should be conducting. In the case of Charles Pollock one might even say that ’the time was ripe’: my meeting in 2009 with the widow and daughter of Charles Pollock, the discovery that his family had preserved and inventoried the artist's estate at their home in Paris and their readiness to share examples of Pollock’s art from all periods of his life (most of it never seen before in Europe) with visitors to the Peggy Guggenheim Collection. In fact, Charles was rather a great representative than an influential figure in 1930. “American scene”. Asked why older Pollock seems to be forgotten comparing to his brother Jackson, Mr. Ryland explain that it is because of artist’s life choices: Charles left New York in 1935 and relocated to Washington with his first wife Elizabeth. He travelled from there to Detroit and East Lansing, Michigan. He chose therefore, early in his career, to leave New York where, instead, his brother Jackson stayed. For this reason he was not a part of system of patronage (Peggy Guggenheim for example), exhibiting, and group activity out of which emerged around 1950 a clearly defined ‘avant-garde’ — the New York School, or American Abstract Expressionism. Furthermore, from the 1930s to the 1950s, Charles Pollock dedicated a great deal of time and spirit to social work for the government, to illustration, University teaching, calligraphy and typography. Photos thanks to the courtesy of Peggy Guggenheim Collection.